I think you’ll agree with me when I say that there’s something very addicting to tracking your net worth. Watching my money grow is one of my guilty pleasure – Personal Capital helps me do that. When I first started my journey towards financial independence, I spent months trying to create the perfect excel spreadsheet to track my progress. I wanted one place where I could check my current net worth, view all my investments, and visually see my progress towards early retirement. I also consider myself somewhat of a DIY-er, so the idea of creating a personalized spreadsheet was appealing. But even at it’s finest, my spreadsheet never fulfilled my needs. It was a clunky mess with multiple tabs. I spent hours every month logging into my different investment accounts and manually entering data into my spreadsheet. I eventually realized that my financial future deserved more than a hacked-together spreadsheet. That’s when I remembered hearing about Personal Capital. When I first learned about Personal Capital, I dismissed it because I thought it was for people who were already had a ton of money. But I decided to give it a try and now it’s my #1 favorite personal finance tool. Now, thanks to Personal Capital, I spend less than 30 minutes every month checking my net worth, analyzing my investments, and making sure I’m on the path towards financial independence. They even have an app! Which means I can check up on my net worth while I’m waiting in line at the grocery store. 👉 Click here to get paid $20 to try Personal Capital! Is Personal Capital safe to use? And finally, whether you should be using Personal Capital or not. Okay, now that you have signed up, let’s learn a little about the company itself. Personal Capital is a financial company with two core components: a free financial aggregation software platform and a paid wealth management advisory. Over 1.6 million people use Personal Capital. Most of them (including me! ), only use the free financial tools that Personal Capital provides. Since their software is 100% free to use, you may be wondering how they make money. How can Personal Capital give us this amazing free software without doing something shady with our information? Well, they do have over $6.5 billion dollars in assets under management. The management fees on those assets are what pays the bill! Allowing us to use the software for free. Personal Capital is an all-in-one financial dashboard. You can link all your investment accounts, bank accounts, credit cards, real estate, and other assets. 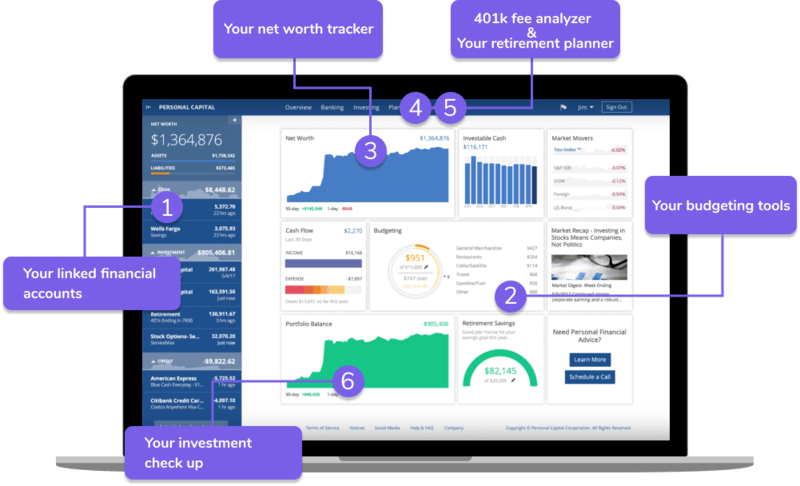 Personal Capital will then track your net worth, income, expenses, budget, and retirement planning. They’ll even offer you free personal finance advice based on your situation. Want to hear what Personal Capital themselves have to say about their platform? It seems like every time you turn on the news, there’s a new company that has their user’s confidential information leaked. You don’t want your passwords leaked, let alone your financial information! Luckily, Personal Capital takes their security very seriously. They have to by law since they’re dealing with people’s financials. They use 2FA (Two-Factor Authentication) and AES-256 encryption whenever you log in to any of your devices. Oh, and you have to register each of your devices. Occasionally they’ll un-register a device, just to make sure it hasn’t been compromised. Here’s what they have to say about their two-factor authentication protocol. Straight from their site. Personal Capital also wants you to know that no internal employees can see or alter your private financial data. Now that your mind is at ease in regards to Personal Capital being secure and safe, let’s move onto the app itself. If you haven’t done so already, sign up for a free account. I’ll be talking about the sign-up process and how to link your accounts, so it’s best if you follow along. By the end of this review, you’ll have your own personalized dashboard set up! Creating an account with Personal Capital is easy. Use this link, give them your email address and phone number. They use your phone number as a second layer of security. Once you finish the registration process, you’ll be redirected to your dashboard. However, your dashboard is going to look empty and boring. Linking your financial accounts is dead-simple and relatively fast. I didn’t have any problems linking any of my accounts. They even had a company-specific 401k program for the first job I had out of college! I did have some issues linking up my Chase Freedom credit card though. It kept telling me it couldn’t verify my credentials. Turned out I was misspelling my password. Doh! User error. At the bottom of the screenshot, you’ll notice that you can add your home or real estate holdings as an asset. They use Zillow’s “Zestimate” to estimate your home value. I’ve found that this number can be wildly off, depending on your area and how much data they have on your home. This was the case for our recently-bought home. Luckily, Personal Capital allows you to manually add a custom value for your home. Once you have all your accounts linked up, your dashboard should be looking pretty sweet. Obviously, when you first hook up your accounts, some of the graphs will look pretty boring. Personal Capital can’t go back in time and tell you what your net worth was a year ago! But give it some time, and you’ll be seeing some nice trends (hopefully!). 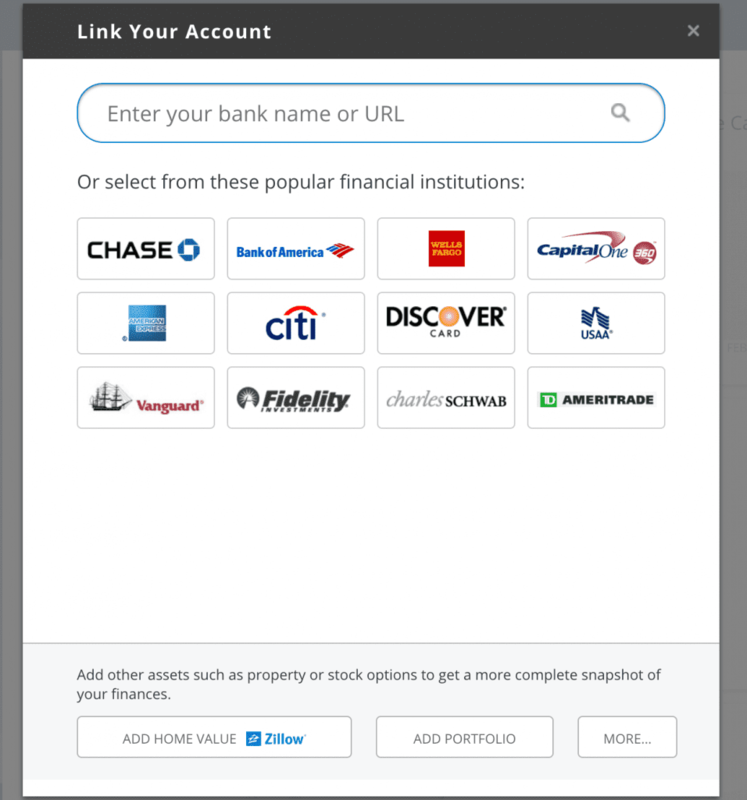 On the left side of the screen, you’ll find your linked accounts ordered by asset type (cash, credit, mortgage, etc). You’ll also see your net worth front and center. The “+” in the top right corner of the sidebar is how you add a new linked account. There’s also a button at the bottom of the sidebar that does the exact same thing. 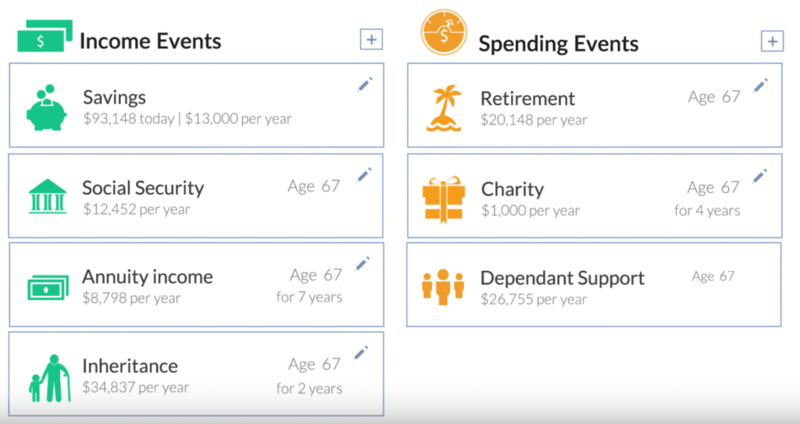 On the dashboard, you’ll see an overview of your budget. The budget section is pretty similar to Mint’s transactions view. The dashboard view will show you the categories you have spent the most money on this month along with how much you’ve spent so far. Click on your budget view, to see a more detailed breakdown. 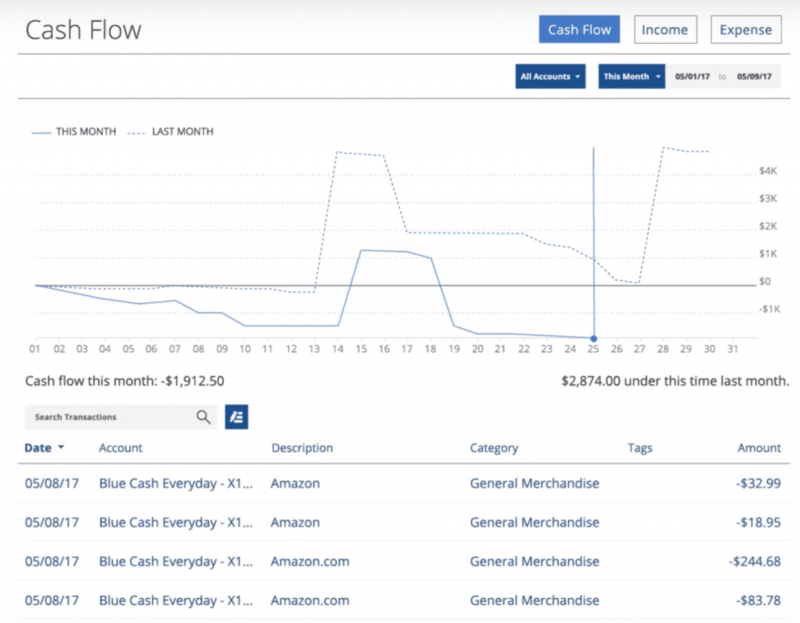 You’ll be able to toggle between a Cash Flow, Income, and Expense view. Your transactions are all neatly categorized by spending category. I personally prefer to use Mint for budgeting – they have much more robust budgeting tools. But Personal Capital’s budget tool isn’t bad at all. Depending on how you budget, it may even work better for you. Remember, unlike Mint, Personal Capital was meant to be an investment tool first. Their budgeting tool is just a nice add-on. Ah, my favorite part of Personal Capital. This is the feature that first attracted me to using this software. On the dashboard, you’ll find your net worth section. It shows you your day-to-day fluctuations in net worth based on your linked accounts. It takes into account any cash, investments, credit card debt, loans, mortgages, and other assets. The net worth tool is pretty straightforward and easy-to-understand. You can view your whole net worth across all your asset classes, or break it down by asset class. I love watching my net worth grow over time! You may not think there’s much of a difference between a 0.5% and 1% expense ratio on a fund. If you had $300,000 in a mutual fund, that’s the difference between paying $3000 and $1500 in annual fees. That’s an extra $1500 you gain every year towards your retirement by choosing a fund that with a lower expense ratio. Knowing the impact the fees can have on your retirement investments can save you thousands of dollars. Once you know if your 401k in tip-top shape or not, it’s time to see how prepared you are for retirement. Personal Capital recently revamped their retirement planner to be even more powerful than it was before. Using your linked accounts, it can forecast your financial situation in the following decades. It’ll tell you if you need to start saving more to reach the income level you want during retirement or if you’re on track. Your projected income during retirement. 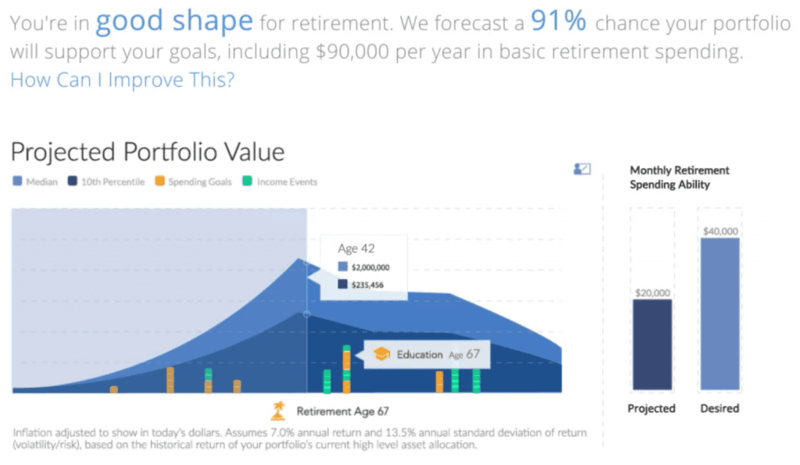 The retirement planner will forecast your expected income based on your current and projected investments. It even attempts to calculate your expected social security benefits – not that you should rely on those… If you expect to have any additional income like rental income, inheritances, etc, you can manually add those too. Your retirement readiness. Using your current investments and monthly contributions, the retirement planner will tell you if you’re on track for retirement. You can tell it how much income you’ll need during retirement and the planner will tell you if your current rate of investment will cover your future need. The impact of your large financial goals. Planning on having a kid soon? Buying a house? Getting married? Add those goals to your planner, and it will tell you if you can afford them while still staying on track for retirement. You can also save each scenario so you can revisit each possible financial outcome every so often. Under Portfolio, you’ll find a variety of investment tools to help you manage your investments. 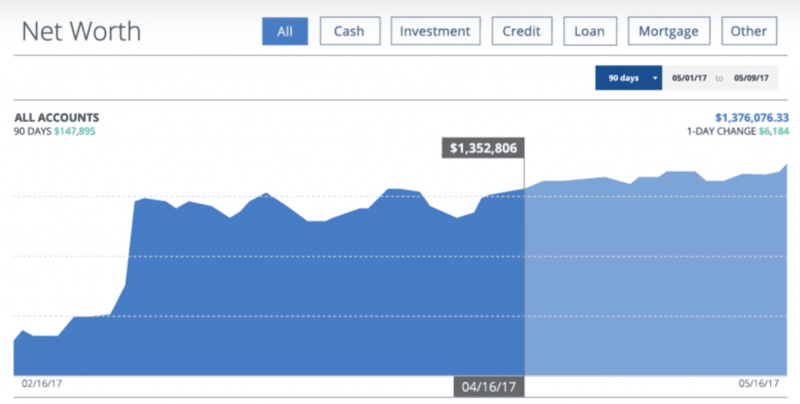 After answering some questions, Personal Capital will present you several different charts that display your current portfolio, asset allocation, and your personal investment performance. Personal Capital will give you a complete allocation breakdown of all your investments. It will break down your portfolio by industry, market cap, etc..
You can click on each sector to get an even more granular breakdown. Personal Capital will even give you recommendations if it thinks your portfolio allocations are out of whack. 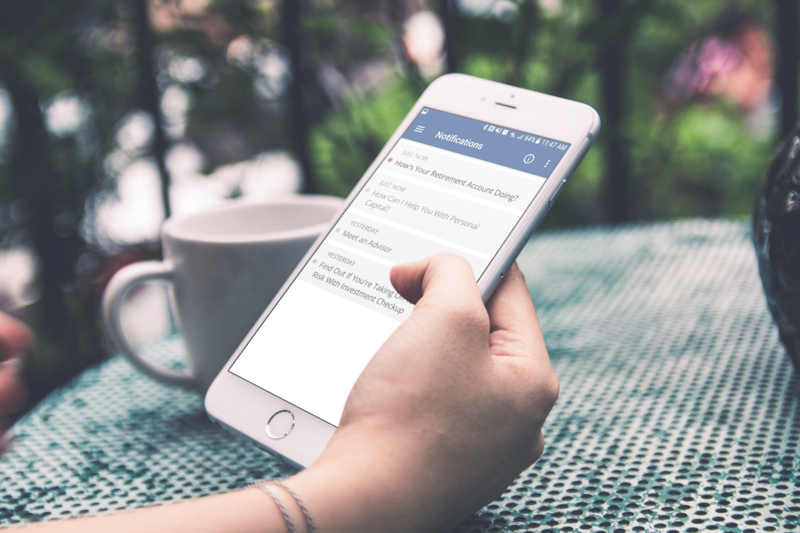 Along with their free financial software, Personal Capital offers an advisory service. They offer three tiers of advisors based on the dollar amount of investable assets you have. Once you start linking accounts, you’ll probably receive a call from an advisor at Personal Capital. They’ll act like they’re giving you free personal finance advice, but it’s a thinly-veiled sales pitch. If you’re not interested, just politely tell them to take you off their call list. I did that and I no longer receive any calls. Personal Capital’s business model is an interesting one. The online software tool is completely free. This is amazing for people like me who don’t want use financial advisors but still want the cream-of-the-crop financial apps. So for most people, Personal Capital doesn’t have any fees. However, Personal capital’s business plan is to pull in people with their free app and then convert them to using their financial advisory services. Hence the phone calls from their advisors. Their financial advisory services do have fees involved. However, they take the ethical approach. You pay a flat-rate annual fee based on the size of your investment portfolio you have with them. They don’t try and sell you over-rated investment vehicles with tons of hidden fees. Their fees are pretty standard for the industry. Remember, this service is completely optional. You are under no obligation to put any of your assets under Personal Capital’s management. Another factor that really drew me towards Personal Capital is the fact that they have an iOS and Android app! That means I can track my net worth and other financial information on-the-go. I was very pleasantly surprised by the quality of their app. A lot of times, a company whose business isn’t the app itself, have bug-ridden and atrocious apps. That’s not the case with Personal Capital’s app – at least not their Android version. You can do nearly everything in the app which you can do on the browser version. However, the first time you log-in to their app, they’ll prompt you to create a 6-digit passcode as an extra security step. Once you do that, you’ll be redirected to your dashboard where you can access all the usual modules – net worth, transactions, cash flow, budgeting, portfolio, holdings, allocation, etc. I’d definitely recommend downloading Personal Capital’s app, especially if you have random urges to check up on your financial situation! Honestly, unless you’re some kind of excel wizard, you’re going to have a hard time replicating all the information that Personal Capital gives you instantly FOR FREE. So whether you are just starting your journey towards a healthy financial future, or you’re well on your way, definitely give Personal Capital a try. You have nothing to lose!